David FeBland’s work considers issues of privacy, conflict and isolation in contemporary urban life, employing a colorist’s eye and a strong sense of formal compositional structure. He describes the interaction between man and our physical universe through a series of invented truths, a sleight of the facts as it were, inspired by observations. 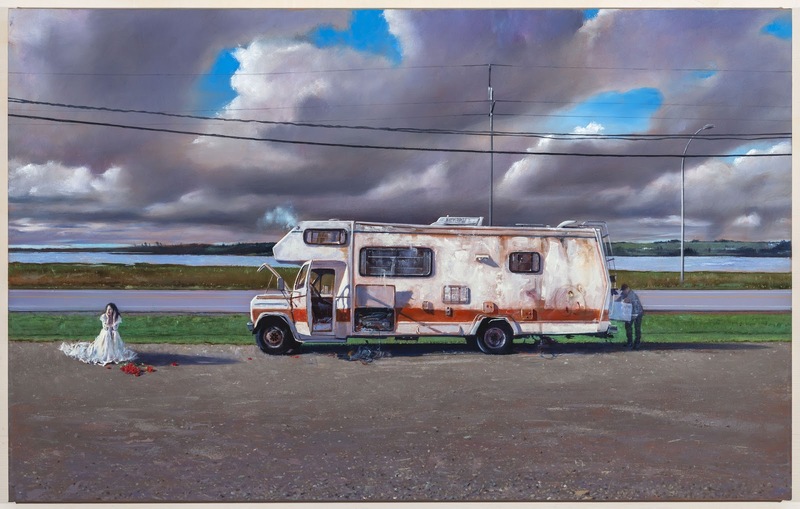 His paintings, drawing upon experiences over a wide range of geographical locations, are driven by a conviction that certain behavioral responses to ones environment are universal. In FeBland’s words, “I’m not particularly interested in making references to popular culture in my work because so much of what we commonly associate with that culture is itself distilled through some medium, originally television but now so many other forms of social media, rather than from direct observation. By creating paintings that derive from my own experience, I become the medium rather than a response to it.”. This is David FeBland's first show at Susan Calloway Fine Arts.